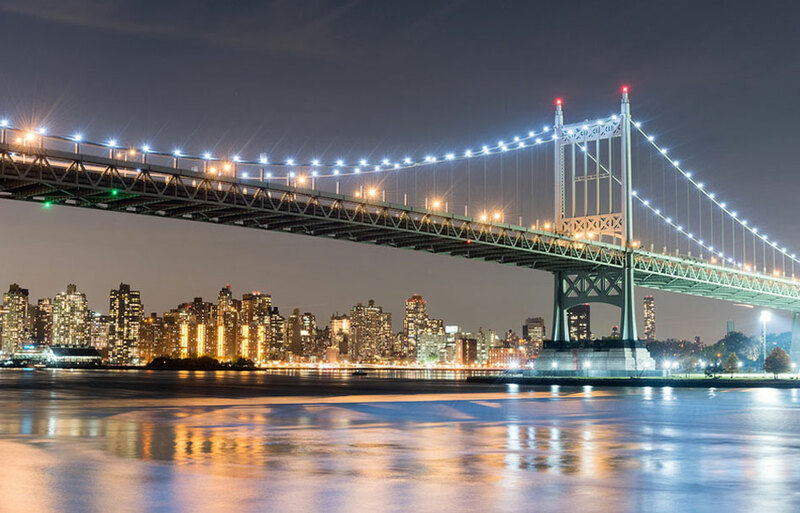 The Triborough Bridge known officially as the Robert F. Kennedy Bridge since 2008 and sometimes referred to as the RFK Triborough Bridge is a complex of three separate bridges in New York City. The bridges connect the boroughs of Manhattan, Queens, and the Bronx via Randall’s and Ward’s Islands. The bridge is owned and operated by the MTA Bridges and Tunnels, part of the Metropolitan Transportation Authority. ACS Underground Solutions was contracted to conduct an underground utility location and mark out on Robert F. Kennedy Bridge which connects Randall’s Island to Manhattan.There are multiple electric and communication conduits that service the bridge's toll booths. Locating and identifying all conduits was critical to preventing damage during construction and avoiding any interruption of traffic flow to Manhattan. The fiber optic lines at the site had no tracer wire connected to them. ACS technicians had to use a flexi trace to make a traceable signal on these very important communication conduits. ACS used highly advanced locating equipment including a 500 kHz Ground Penetrating Radar (GPR) antenna on this site to verify such lines. The ACS team of technicians used a combination of equipment, skill, experience, and knowledge to successfully identify and locate these important communication and electric cables.